These, my friends, are so good. Granted, I could eat quacamole (a well, prepared one, at least) until it comes out my ears. So that might be why I like this so much, but even if you aren’t a guac-freak like me, I’d say there’s still a good chance you’ll like these. Unless, of course, you’re married to me. Then you wouldn’t even come in the same room while I’m eating them because avocados scare you. Yes, now the world knows, honey. I liked everything about these tostadas, and was bummed when it was all gone. 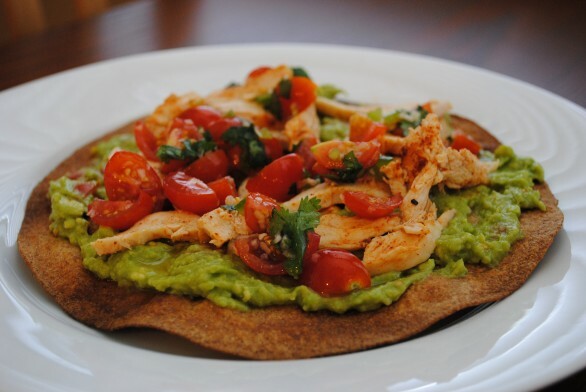 The flavors play nicely together and I like how the textures give it a little variety in every bite, especially with the crispness of the toasted tortilla and creaminess of the guacamole. De-lish! Place avocado in a small bowl; mash with a fork. Stir in 2 tablespoons tomato, 1 tablespoon onion, 1 tablespoon lime juice, 1/4 teaspoon salt and garlic. Combine remaining 1 cup tomato, 2 tablespoons onion, 1 tablespoon lime juice, 1/4 teaspoon salt, cilantro and jalapeno; toss well. Combine chicken, remaining 1 tablespoon lime juice and paprika; toss well to combine. Spread about 1 tablespoon guacamole over each tostada shell; top each with 1/4 cup chicken mixture and about 2 tablespoons salsa. Enjoy!